Physical Description Rhiana is tall and of slender, athletic build. Her jet-black hair is cut in the military style many of of her people, military or civilian wear, though shorter than really suits her. She has regular facial features with a chiselled jawline and a straight nose. General Overview Rhiana is a career officer. She has never been anything else and cannot imagine living a different life. With that comes a certain rigidity in dealing with others. At this point in her life, her duty is the only thing that keeps her going. Even if she has become what she has always feared and tried to avoid: a traitor to her people. Abandoning them in their darkest hour. Strengths & Weaknesses Solitary - Except for a short time in her life, Rhiana has never had friends or even real acquaintances. By now, she is used to being solitary, and does not even try to make new friends, preferring instead to keep to herself. Hierarchic - Hierarchy is a very important concept for Rhiana. She will usually obey orders from her superiors without question and expects the same from her subordinates. Perfectionist - Having been through quite some drill in her life, Rhiana has learned to appreciate perfect organisation. It does not only mean that her gear is always in perfect order. It also means that her reports are flawless and her attention to protocol bordering on obsessive. Strong Will - This has not always been the case, but Rhiana has learned to detach herself from what she hears and experiences, being careful what to believe and what not and also whom to trust (practically noone). At times, it was this iron will that has helped her to go on, to do what is right and to continue to do her duty. PTSD - Two counts. One diagnosed and being treated, one not. The diagnosed case is, of course, the Hobus star going nova and the subsequent loss of her entire family and destruction of her homeworlds. High Pain Threshold - As a consequence of the first, undiagnosed and untreated, PTSD condition, Rhiana began to disassociate herself from her body. She drove herself to exercise more often and more intensely, often choosing sparring partners quite superior to her, only to thrive on the pain she then incurred during training sessions. Now, years later, she does not fear pain. She even embraces it to a point. Sense of Humour - She has none. In most situations, her facial expression would do a Vulcan proud. Ambitions To create a new life for herself. Hobbies & Interests Llaekh-ae'rl - Translated as 'laughing murder', this is a common Romulan martial art with (near-) deadly moves executed in a fluid, elegant style. Rhiana has been trained in this art from her early childhood and has mastered all levels. Long-distance running - An avid runner, Rhiana is able to cover long distances rather easily. She tries to run several miles per day, more if she has the time. Writing - If one can call it that. She has an almost life-long diary that she updates frequently. It is stored in an old datapadd that was a gift of her parents' for her fifth birthday. Personal History Rhiana e-Fveirrolh t'Aegis was born Rhiana ir'Thieurrull t'Fveirrolh. In her, for a Rihanha, young life, she had gone through a lot. Her parents had been dissidents, she had spent most of her youth in a government-run orphanage, had as a young officer and with hatred and desperation in her soul, helped the Tal Shiar find and destroy the dissident organisation her parents had run. 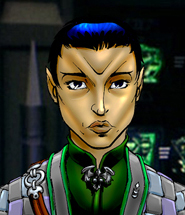 Ended up falling in love with Aerv'saihlan i-Ra'tleihfi tr'Llhaenn, the tlaru, the Tal Shiar agent, who led the operation and who had ordered (and possibly watched) her parents' execution. And who had had the audacity to claim Rhiana's baby sister - born in captivity - for his own hfihar, his own house. It had taken her months to convince him to release Jaeih into the hands of her own hfihar - she had been adopted into one of the relatively new houses, a mere 350 years old, but one of the most powerful ones, even if that power was rarely publicly shown. But in the end, she had succeeded and Jaeih had found a new home. Years prior to her parents' demise and to her own adoption, despite her background and with more hard work than others would have needed to perform in order to achieve the same, Rhiana had been assigned as a junior medical officer aboard the First Fleet's flagship, the ChR Areinnye'Aidoann. Of course, she had had no say in her assignment just as she had had no say in the choice of her training. But she /was/ an excellent medical officer. Had an eye for detail and precision. At the same time, she had kept up a daily exercise which helped her to cope with the challenge of being a continual outcast. She had had no friends. The label 'daughter of traitors' had stuck to her whereever she went. Maybe, probably, that had been why she had not shied away from the odd conversation with Outworlders when the occasion presented itself. Which had lead to the Incident with the Klingon. Which had led to almost destroying her fledgling career. In retrospect, she had only got away alive because the khre'Enriov, the fleet admiral, who had been the one to find out about the Incident, had had a soft moment and, more importantly, had herself been fraternising with the enemy, albeit without ever getting caught or blamed for it. Strangely, the Incident, or rather, the consequences of the Incident and Rhiana's steadfast insistence on obeying her orders not to talk about it, had led to her being adopted into s'Aegis, a powerful and secretive hfihar based on ch'Havran. Things had begun to improve after that. Eventually, she had been promoted to being the vessel's executive officer. And then... things had begun to fall apart. She had been aboard the 'Aidoann, on a mission at the far end of Rihannsu space, when news about the Hobus star had reached them. They had abandoned the mission and returned home at full speed. Only to discover that 'home' did not exist anymore. The crew of the 'Aidoan had done what they could, but with High Command and all of government gone... there had been a huge void and the Rihannsu, as a people, had been too shocked to be able to fill it. Somehow, they had managed to go through the motions. The 'Aidoann had kept up border patrol with other vessels that were returning. Pirates and Klingons alike kept trying - and succeeding - to violate not only the Neutral Zone but also the border and the diminished Rihannsu fleet had trouble fighting them back. Rhiana had kept at it for a few months. Had worked around the clock to numb the pain, to keep herself from thinking, from feeling. Had succumbed (a second time) to the use of stimulants to keep herself from sleeping to prevent the nightmares to return. Of course, she had not been the only one having lost literally everyone. Quite in the contrary. At times, the crew had seemed as if operating on autopilot. Discipline had begun to slip, despite Rhiana's best efforts. Instead of being glad that they had survived, they kept asking themselves 'now what?'. A temporary government had been established. Smaller hfirrn who had not had their main powerbase on one of the Twinworlds had the upper hand now, taking advantage of the terrible loss of life to advance their stations in what remained of the Empire. It had been too much for Rhiana. Utterly exhausted, she had collapsed on duty and woke up in the medical bay. She needed rest, the chief medical officer had told her, ordered her off duty for half a tenday. To recuperate, get some strength back. Rhiana had complied, but back in her quarters, she had wondered what for she would need to recuperate. There was nothing left for her. Everyone she had loved was gone. Her entire hfihar, as far as she had been able to determine, had been extinguished. Of course, she could remain aboard the 'Aidoann. Rebuild the Empire. But what for? With her betrothed among the dead, she could not imagine ever finding a suitable replacement. With her hfihar gone, she could not imagine finding a place in another one. And the Galae, the imperial navy? It was in shambles and would take years, decades to rebuild. Much like the Empire. She simply could not muster the strength, the courage to continue. Rhiana had considered suicide. Had gone as far as actually feeling the cold steel of her dagger against her skin. But despite everything, despite the emptiness she felt within her, she had been unable to go through with it. Somehow, deep, deep, deep inside her, there was still a will to live. Instead, she had done the unthinkable. She had packed a bag with her most precious belongings and requested a leave of absence. When it was granted, she made her way in civilian clothes, aboard freighters and other small passenger vessels to the nearest space station that had a Federation embassy. Wearing her uniform - she had no intention to do so under false pretenses - she requested asylum, with the reason that she would face execution for desertion if she ever returned to the Empire. Which was true. This was a point of no return. Her request was granted a few days later, then, being a military officer and potential spy, she was transferred to someplace else - she never knew where - for a thorough debriefing. Rhiana cooperated to a certain point. She shared some of her service record with her interrogators but refused point blank to speak about any mission she had been on in her career. Thankfully for her and contrary to her expectation, Starfleet operated under different rules from the Galae and she was never mistreated. Indeed, while she was subjected to a medical examination and her substance abuse was detected, she was offered treatment for it which she accepted. She was also offered counselling sessions which she declined. Several weeks later she was released. Unable to imagine more than a century of civilian life ahead of her, Rhiana had requested to be allowed to apply for Starfleet Academy. The request was granted. Rhiana applied and was accepted under the condition that she follow an intensive Federation Standard language class and attend counselling sessions. The years at the Academy were strange for Rhiana. First of all, it was quite a change for her to go from being erei'Riov, Commander, and executive officer of a flagship to being nothing more than a cadet. Then, there was the enormous age gap between herself and her fellow cadets. She also was, apparently though not surprisingly, the only Romulan. Once more, Rhiana made no friends. For her, besides being Outworlders, the other cadets were barely more than children while she had twenty years of military career behind her. Not socialising gave her time to concentrate on her studies, first and foremost, to master their language. It was not easy. She had never had to learn another language and Standard sounded very harsh to her ears. She also chose security and tactical as major instead of medicine. By breaking with the Empire, she had decided to begin completely anew, which also meant not to go the familiar route in her studies. Despite the new material - Federation law baffled her more than once -, she managed to graduate the Academy in three instead of four years and immediately enrolled for Command School. She graduated Command School in 2394 and requested an assignment that would keep her as far away from the Romulan Empire as possible. Service Record Up until 2388 - Service aboard ChR Areinnye'Aidoann. Details classified or unknown.